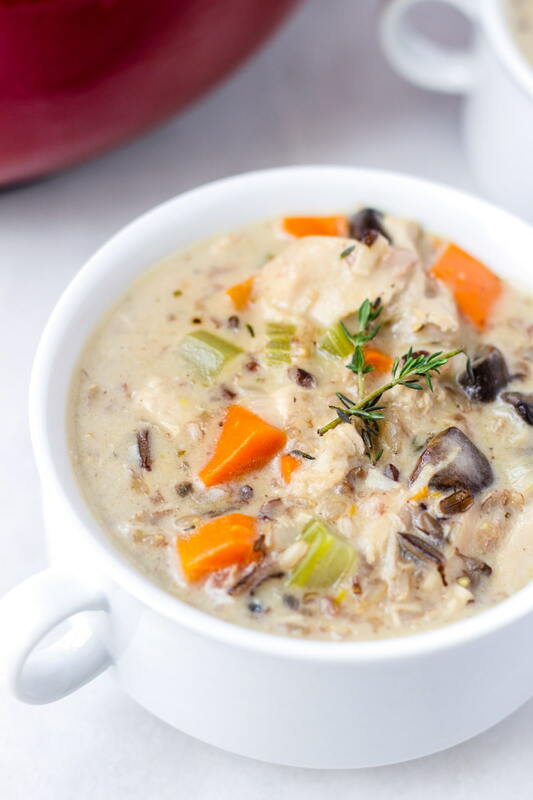 A bowl of creamy turkey and wild rice soup will surely bring comfort and warmth! 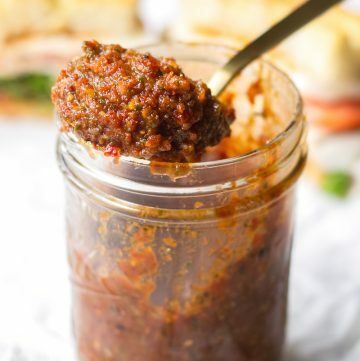 It’s also an easy way to use leftover turkey. 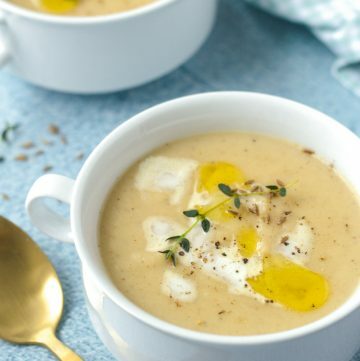 Make a large batch of this easy soup recipe and freeze it! I love finding ways to use leftover turkey. It’s almost Thanksgiving, which means a big turkey will be cooked and we’ll all end up with plenty left. 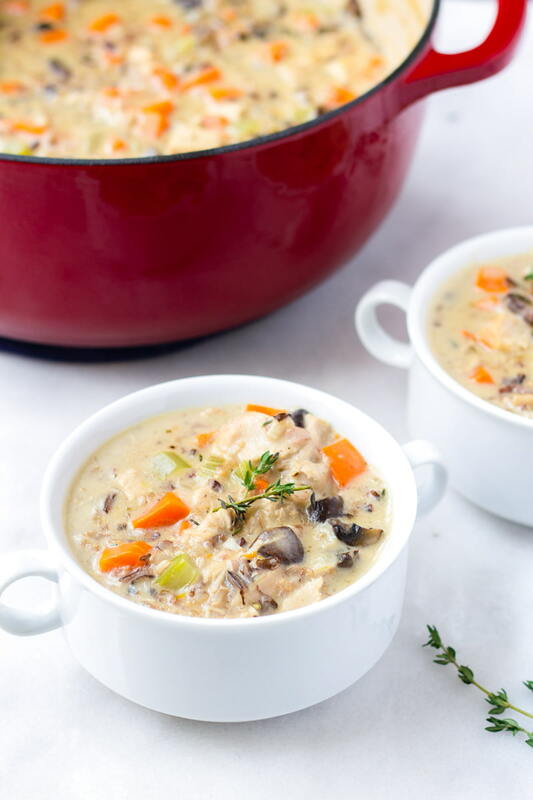 My favorite thing to make with leftover turkey is soup! 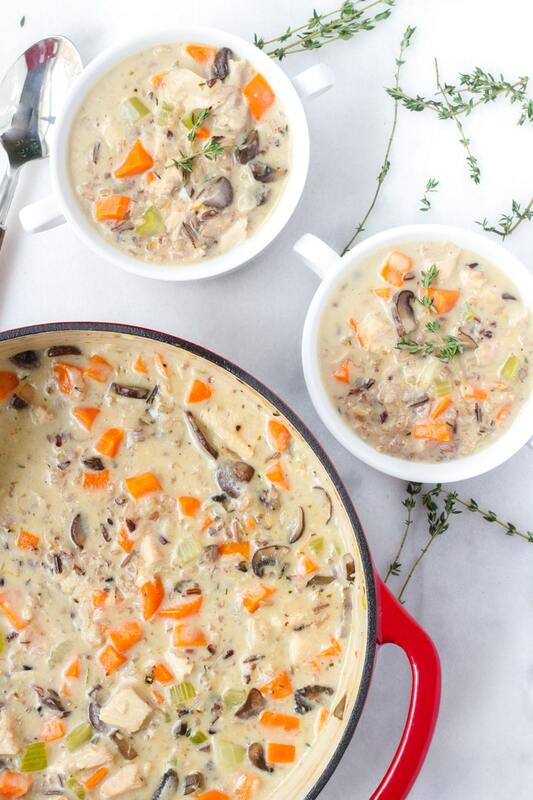 This creamy turkey and wild rice soup is the definition of comfort, especially in this winter weather. This makes enough for about 6 to 8 people. Let’s go over what’s in it, shall we? Cook rice according to package directions. It should take about 45 minutes for wild rice blend to cook. Sauté the veggies (carrots, celery, onions, mushrooms) add aromatics (garlic, thyme, oregano). 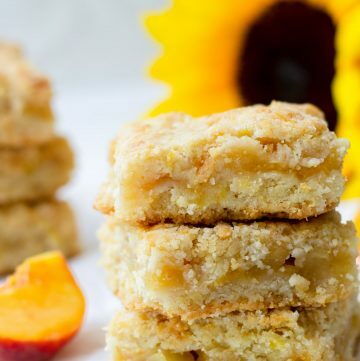 Stir in flour to coat veggies, and cook for about 3 minutes. Why? This will help thicken up the broth. Add broth gradually, stirring. Why? This will help incorporate better and thicken the broth well. Add cooked rice and turkey. Cook for 15 minutes, covered. 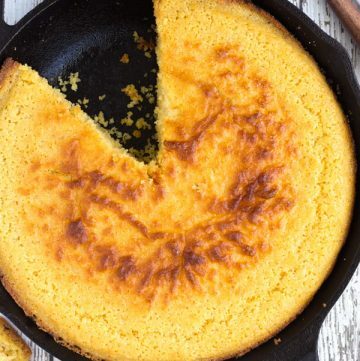 Stir in half-and-half for creaminess! I get this question a lot. Cooking wild rice takes longer than cooking brown or white rice, about 45 minutes to 1 hour, and may sometimes not absorb all the water. Although, if you’re using a wild rice blend, like I did, you shouldn’t have issues with water absorption. Simmer undisturbed: Once you add the water and bring it to a boil, lower the heat to simmer. And just let it simmer undisturbed, covered. If you open the lid constantly and stir it, you’ll end up with something like risotto. Be patient: It takes me about 45-50 minutes to cook wild rice. Let it steam off the heat: Once the cook time has passed, remove from heat and let it steam, covered, for 10 minutes. Then fluff with a fork. This helps with texture. Thank you again for reading! 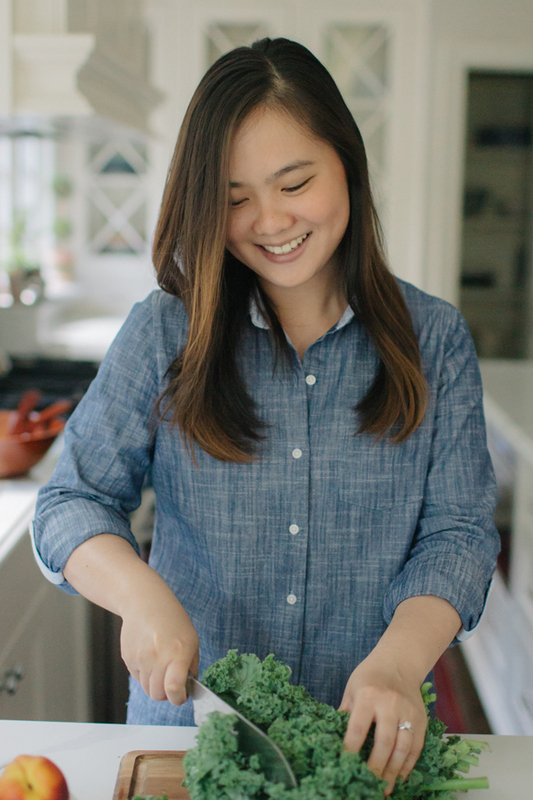 I always enjoy sharing recipes and kitchen tips with all of you. It brings me true joy, and it’s a lot of fun! For a heartier soup, use wild rice blend. 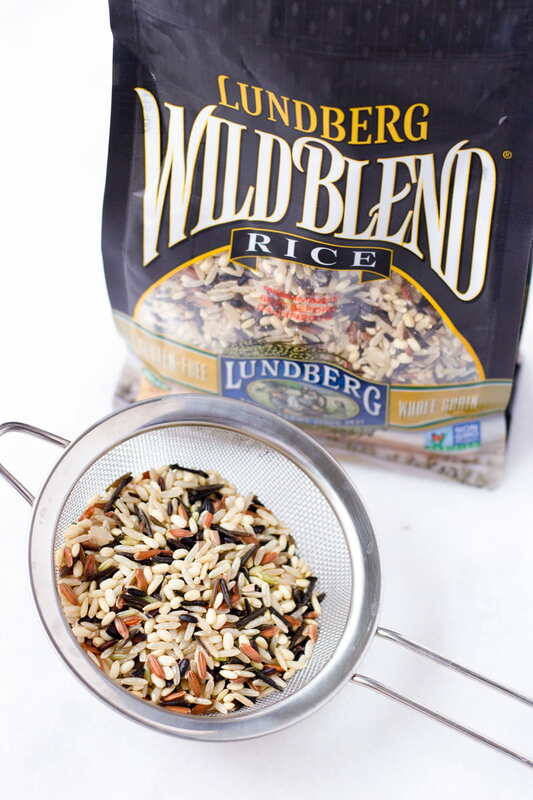 My favorite is Lundberg Wild Rice Blend, which contains brown rice, wild rice, and whole gran rice. For tips on cooking wild rice or wild rice blend, see “how to cook wild rice” above. Easily substitute out the turkey for a rotisserie chicken. 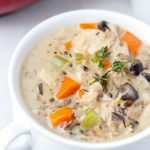 This Creamy Turkey and Wild Rice Soup is great way to use leftover turkey and enjoy a bowl of pure comfort. 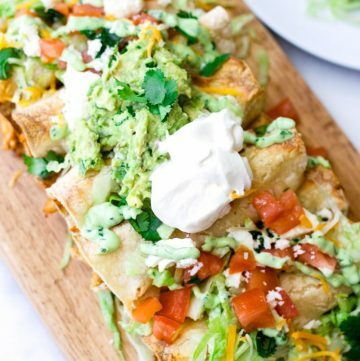 You can also use rotisserie chicken instead! Cook rice according to package directions. It should take about 45 minutes if using wild rice blend. Heat a large Dutch oven to medium heat and add 2 tablespoons olive oil and 1 tablespoon unsalted butter. Sauté garlic, onion, carrots and celery until softened, about 5-8 minutes. Add thyme, dried oregano, and mushrooms and cook for another minute. Stir in flour and cook for about 3-4 minutes. Add broth little by little, 2 cups at a time, stirring to make sure the liquid and the base are combined evenly. I added 6 cups, but if you prefer, add more until desired consistency. Keep in mind that it will thicken up as it boils since we added flour. Stir in 3 cups cooked rice and cooked turkey. Season with salt and pepper to taste. Bring to a boil and then bring the heat back down to a simmer. Cook for 15 minutes, covered. Stir in half-and-half, and simmer for another 5 minutes. 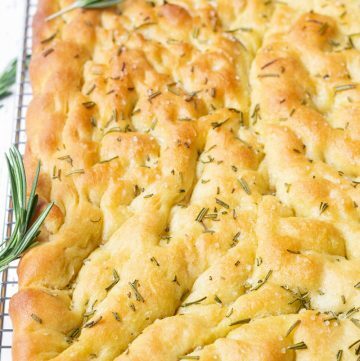 Serve with bread or crackers. Enjoy!